Home \ Cars \ Tesla Roadster Acceleration TEST – 60 in 1.9 seconds!! 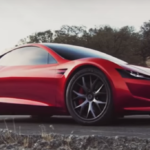 Awesome Tesla Roadster Acceleration TEST >> From 0 to 60 MPH in 1.9 seconds!! from 0 to 100 MPH in 4.2 seconds!! Those times put the Model S’s Ludicrus mode to shame. Love the car but it is not a sport car… it is a street legal dragster which is cool but not a sport car like Ferrari. The battery alone will weigh almost as much as a true „sport car“. Two problems to think about; 0 to 100 back to 0 speed/distance & cornering all that weight is a complicated engineering problem.